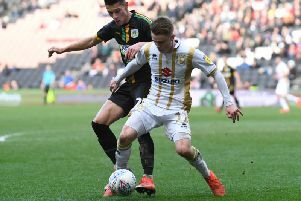 A young MK Dons side shared a 1-1 draw in a behind-closed-doors game against a strong Northampton Town side at Moulton College on Tuesday afternoon. Former Dons midfielder Daniel Powell gave Cobblers the lead after 18 minutes when Morgan Roberts' corner was only half cleared, beating Lee Nicholls via a deflection. Lawson D'Ath was proving a threat for the visitors, but it was the Cobblers who should have doubled their lead on 34 minutes when Andy Williams looked to have scored after being picked out by Timi Elsnik, but the ball fell inches wide of the post. A few minutes later and MK were level through on-loan Middlesbrough striker Stephen Walker. Powell almost restored Town's lead immediately, only too see his strike hit the post and bounce to safety. Both sides continued to create and miss chances in the second half, and Junior Morias thought he had headed Northampton ahead on 70 minutes, only to see his effort from Roberts' cross ruled out for offside.